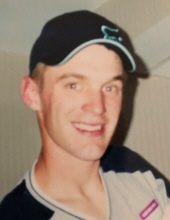 Ryan P. Sorrell 39, of Madison Township, passed away on Friday, April 12, 2019 at home. He was born on Tuesday, May 8, 1979 in Middletown. He was preceded in death by his mother, Connie (Carll) Sorrell; and grandparents, Stan & Jean Sorrell and Alice Carll. Funeral Service will be Thursday, April 18, 2019 at 10:00 am at Wilson-Schramm-Spaulding Funeral Home, 3805 Roosevelt Blvd, Middletown. Visitation will be Wednesday evening from 5:00 - 8:00 pm at the funeral home. Burial will be at Woodside Cemetery and Arboretum. In lieu of flowers memorial donations may be made to the Sorrell Family in care of Wilson-Schramm-Spaulding Funeral Home, 3805 Roosevelt Blvd, Middletown, Ohio 45044. To send flowers or a remembrance gift to the family of Ryan P. Sorrell, please visit our Tribute Store. "Email Address" would like to share the life celebration of Ryan P. Sorrell. Click on the "link" to go to share a favorite memory or leave a condolence message for the family.